We all have rooms in our home that instantly attract clutter. 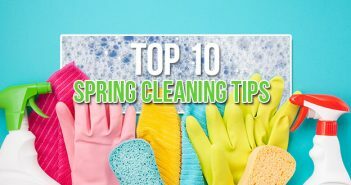 The attic, basement, garage and office are the biggest offenders, and notorious catch-all areas for just about anything that comes through the door. Don’t worry – even the most organized people struggle to keep these areas tidy. With these quick and simple home organization tips, you can cut down on the clutter and control the chaos. An attic can be one of the greatest storage spaces in a person’s home. It can also be one of the messiest. Half-filled boxes, holiday decorations and piles of unused items can add up quick. The good news is that organizing an attic is not as hard as you think. Follow these easy steps so that everything you need is accessible and you’re not tripping over loose items every time you go up there. Assess the mess: As you sort through your stuff, decide which items you’re going to keep, donate or toss. Keep like things together: Seasonal clothing, holiday decorations and tax returns should be given their own separate box or bin and not combined with one another. Label boxes and bins: For anything that’s in a box or bin, label it with blue painter’s tape and a permanent marker. That way when you need a certain item, you won’t have to sift through everything. Consider shelving: Metal shelving is affordable and will allow you to bring your stuff up off the floor. Whether it’s your attic or another room, it’s critical to set an order of what rooms you want to tackle. Take inventory and assess value: Deciding what you need and don’t need can be hard, but if you haven’t used it in the past year, pitch it. Get rid of extra stuff: Once you’ve decided what to toss, consider donating gently used items to family, friends or your local charity. Label everything: Labels allow you to know exactly what’s in each bin, box or bag quickly without having to think twice about it. Add storage space: Built-in cubbies and shelves are versatile storage options that allow you to make use of every square foot. Clearly labeling boxes will make it much easier to find items when you need them. Take everything out: This will give you a better idea of the space you’re working with, as well as allow you to easily determine what items you need and don’t need. Maximize wall space: Getting stuff up and off of the floor is important if you’re planning on parking your car in there. Mount sturdy shelves up higher to store larger items and add hooks to hang everything from bikes to yard tools. Install cabinets: Cabinetry is not just for your kitchen and bathroom. 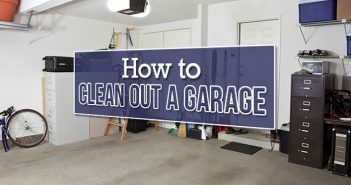 Cabinets are a great addition to any garage to keep out-of-season items out of sight. Hanging tools on the wall will help maximize the floor space in your garage. A cluttered home office can really slow you down, especially if you’re trying to run a business or simply pay the bills. While it’s easy to overlook this room compared to other areas of your home, organizing your home office is essential for improving productivity. Get rid of that distracting mess by using these tips to organize your home office. Clear your desktop: Clear all papers, pens, books and anything else that’s scattered on the top of your desk. For those documents you no longer need, toss them in the trash, or better yet, shred them. If you’re like Dana White, author of A Slob Comes Clean, one of the ways to cut down on paper clutter is to opt out of stuff. Create a filing system: One of the easiest ways to get rid of paper clutter is to establish a filing system to store important documents. Categorize each folder or bin according to your needs (i.e. bills, medical, outgoing mail, etc.). Manage cables: Cords snag your feet, get tangled, attract dust and are an eyesore. You can fix all that by bundling your cords with cable ties, sticking them under your desk with adhesive cable strips or investing in a wireless keyboard and computer mouse. Store items out of sight: The more you see, the more cluttered a room appears to be. A simple solution is to store all office supplies in baskets, bins, drawers or any other storage unit you have. Consider storing important documents in areas that can be easily and readily accessed. great info,,,thank you very much! question: how long before the hair I’ve already ripped out of my head take to grow back? smilly face herewith—-…….